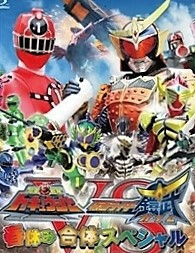 The Ressha stops at the Zawame City station, but instead of a Shadow Creep they discover Moguraroid of the Badan Empire, Kamen Rider Gaim, and a mysterious Kamen Rider. Regions are unavailable for this movie. Click the "Watch on Netflix" button to find out if Ressha Sentai ToQger vs. Kamen Rider Gaim Spring Vacation Combining Special is playing in your country.